6 negatives : b&w; ; 4 x 5 in. Luigi Biagini, Rome Post Legionnaire and former interpreter for 3rd battalion of the 442nd Regimental Combat Team in Italy, at the Nisei Veteran Association reunion dinner at the San Kwo Low restaurant and visiting the World War II Nisei memorial at Evergreen Cemetery in Boyle Heights, Los Angeles, California, October 9, 1950. 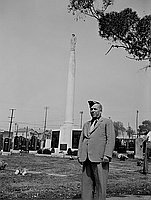 Caucasian and Japanese American men wear suits and overseas hats with patches and pins at dinner and monument. Three men identified (96.267.33_3), Luigi Biagini, George Ozaki and Isao Tabata. Monument is dominated by a statue of a soldier, Sadao Munemori, standing atop a tall white column flanked by plaques with quotes and dedication. Written on original negative envelope: Nisei Veteran Association convention -- Reunion.